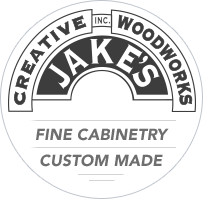 Welcome to Jake’s Creative Woodworks, Inc., your premier residential and commercial custom woodworking shop. Started in 2003 by Jake Gieschen, our staff of skilled craftsmen have specialized in building dream kitchens, bathrooms, custom built cabinetry, woodworking and more for clients in the Sedalia, Columbia, Lake of the Ozarks, Warrensburg, Marshall and surrounding areas. Throughout our travels from home to home, we’ve had the pleasure of working with countless great customers; because of them we have built a reputation which is solid as oak. Our innovative crew is equipped with a great facility and state of the art tooling to produce the highest quality product possible. So, whether your next project is large or small, make your money worth more than just mere dollars and experience what fine woodworking is all about. Come to Jake's Creative Woodworks for all your woodworking needs. We would welcome the opportunity to earn your trust and deliver you the best product and service in the industry.